According to some research, there are three things that everyone needs to be happy: a home of your own, meaningful work and friends. David has been supported by PCL for approximately 17 years. Nine of these were at the Queen St. Apartment, two at Westheights, and most recently, six at Blueridge. David’s working career began at St. Louis Roman Catholic Church in Waterloo in 1992. For two of those years, David worked with his Dad, Nate, until Nate retired. In 1998 ,David went to work for St. Francis of Assis Roman Catholic Church in Kitchener; right across the street from Blueridge home. At St. Francis, Nate came out of retirement to work with David, doing maintenance work, but was once again ready to retire in 2008. There was some concerns around who would take over for Nate as this person would now be supervising David. Gary Howell was approached to take the position, but he already had a job teaching at Conestoga College. Gary finally did decide that he would like to retire from the college and take the position at St. Francis, but that couldn’t happen until 2009. 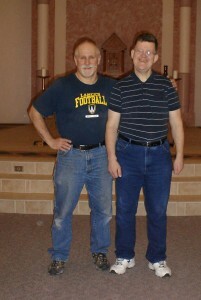 Nate was convinced that Gary was the right person to be supervising David, so he continued to work at St. Francis until Gary took over in 2009. During a short talk with Gary Howell, this writer learned that Gary understands David’s challenges, has been steadily working with David so that he is consistently successful at the tasks that Gary sets for him, and encourages David on a regular basis to learn new things and to master these as well. David has also worked as a volunteer on Thursday afternoons at Victoria Place Retirement Residence for approximately 11 years, and at the Kinsmen Center on Friday afternoons as a paid employee for the past 5 years. Along with his housemates, David considers Jim, the maintenance supervisor at Victoria Place, a long-time friend, and Gary Howell, at St. Francis Church, a new friend. How does David describe himself?